Like hands folded in prayer, the tall tapered spires of Immanuel Lutheran Church are emblems of a religious structure that has graced downtown Rock Island for over a century. At 162 feet high, the main steeple may well be the tallest in the community. Even the building’s secondary steeple is 108 feet tall, equivalent to a 10-story building. Although the picture on this Real Photo postcard dates from about 1915, it could have been made yesterday, so little has this church at 20th Street and 5th Avenue changed in appearance. Its history begins in 1855 when a German immigrant to Rock Island sent a letter to St. Louis asking for a cleric to form a German Lutheran congregation here. By June of 1856, the first pastor of the “Evangelical Lutheran Immanuel Congress of United Augsburg Confession of Rock Island” was installed. The name, although descriptive of the beliefs of the new congregation, was a mouthful and soon was informally referred to “the German Lutheran Church.” Today, we know it as Immanuel Lutheran Church. The early congregation grew and prospered. In 1857, it was reported that land with a building was purchased at 6th Avenue and 13th Street. A year later a church was constructed at that site. There is no evidence of that vintage church today, although a very old white frame church was located only a block away at 14th Street until a few years ago. Since addresses were sketchy at best in the 1850s, that may have been the original church. In 1865, the current site on 20th Street and 5th Avenue was purchased and another church was built. It faced 20th Street and cost $10,000, including the land. After serving the congregation for 30 years, it was demolished, to be replaced by the church we see on this postcard. The cornerstone for the new church, which faced 5th Avenue, was laid on June 28, 1896. It contained church documents, local newspapers and a church history, as well as the names – apparently only the names — of incumbents President Cleveland, Illinois Governor Altgeld, and Rock Island Mayor Knox. 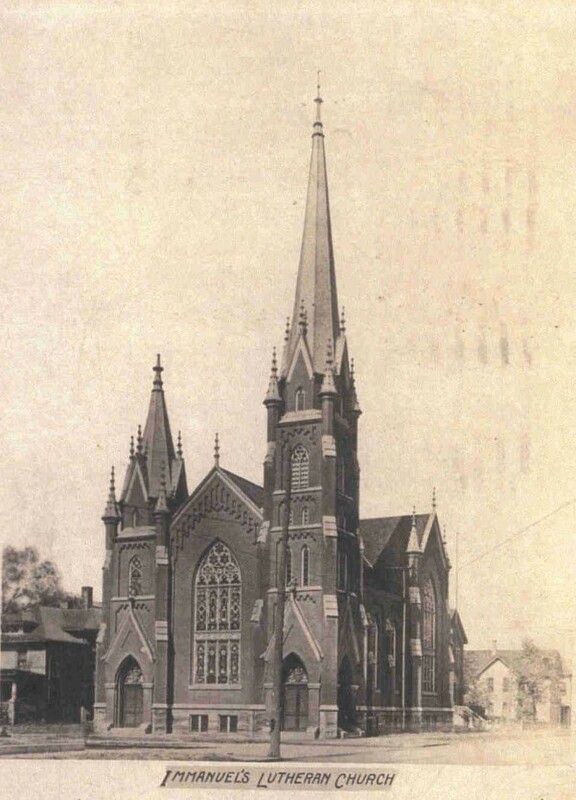 The local architectural firm of Leonard Drack and George Kerns was retained for the design, which newspaper accounts lauded as “pure Gothic style” and “more after style of churches in the metropolis with its tall steeple and cathedral windows.” Built by contractor Nicholas Juhl at a cost of $25,000, it was made of St. Louis pressed brick with stone trimmings and measured 62 x 102 feet. Reports called the interior “fully in keeping with the exterior. The groined arches of the lofty interior with the Gothic pulpit and altar are truly impressive and well calculated to exalt men’s minds.” The pulpit and altar were of ash, carved by the Variety Wood Works. The Gothic style is well expressed in the main windows and door openings, which have a typical pointed arch or “lancet” or shape. The larger windows — note the one at the front of the church — have smaller lancet windows as well as clover-shaped “trefoil” windows incorporated into their design. The magnificent stained glass panels were said to be donated by the ladies of the congregation. The nave seated 1000, with more accommodated in the balconies that extended from either side of the choir loft, which was located at the south. As many as 1400, many from miles away, filled the church for each of the three dedication services on the Sunday before Christmas in 1896. The first two services, in the morning and afternoon, were conducted in the German language. For the morning celebration, a sixteen-voice choir was accompanied by the grand pipe organ, while in the afternoon, 200 children from the parochial school, located behind the church on 20th Street, joined the services. In addition to window light, the nave was illuminated by two magnificent electric brass chandeliers, a gift of F.C.A. Denkmann. During the evening dedication services, a fuse blew, throwing the congregation into darkness. News accounts noted that this could have caused panic, but that those present showed “marvelous composure.” The pastor, who was playing the grand pipe organ at the time, continued to play and the congregation joined in song until lights were restored. This, the last dedication service of the day, was conducted in English, although German would continue to be used for worship, instruction, and confession. until 1924. Looking at this church today, it is amazing how a church was built for $25,000 that would cost millions today. Even in 1896, a nice frame house could easily cost over $5000. The secret? Just as in historic European cathedrals, Immanuel Lutheran Church was the beneficiary of much donated labor. Many of the finest craftsmen in the area were of German descent and were members of this congregation as well. Their efforts have resulted in a lasting memorial whose appearance greatly enriches our city and indeed exalts our minds. The Immanuel Lutheran congregation left this building in 2010, taking part of the large stained glass window on the south with them. The church was purchased by Roy Yelder, who undertook needed repairs and improvements. It now houses a new congregation. This article by Diane Oestreich is slightly modified from the original, which appeared in the Rock Island Argus and Moline Dispatch on January 18, 2004.